Parke County Covered Bridge Festival is a fun time. But, once you commit to perusing vendors' tables, you can become overwhelmed. Javaroma Roasters was a very happy discovery for me in Bridgeton, IN. The fresh brewed cup of Sulawesi Toraja that I tried, led to me returning to the Javaroma Roasters table to purchase a 1/2 lb before heading home. This bag of Sulawesi Toraja, ground for French Press, is different than what I am used to, grocery store coffee, roasted who knows where and when, and ground who knows when. I almost exclusively drink dark roast. Sulawesi Toraja has a full, round flavor with depth. I've been brewing everyday in my French Press in order to get the full extraction of flavor. It is truly a flavorful cup! 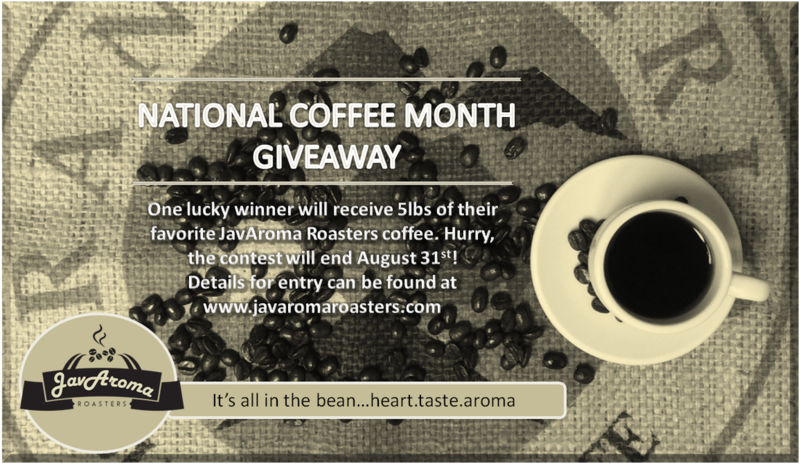 -Lisa S.
August is National Coffee Month and what better way to celebrate then with FREE coffee from your JavAroma Roasters. Starting August 10th until the end of the month, a contest will begin resulting in one lucky winner. The grand prize will be 5lbs of coffee of your choosing from the current offerings. Entry Rules: Write a review on the following review sites, send the review link to javaromaroasters@gmail.com & you will be entered into the drawing. And the best part is...you are not limited to just one entry. If you want to write a review on each site listed below, then you will get an entry per site review. You must send it to the email or it will not be considered a valid entry.